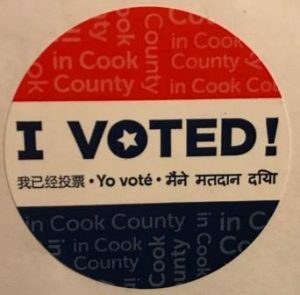 The Founding Fathers talked about duty and the principles behind voting, but they didn’t live in Illinois. If they had, they would have seen just how useless this frustrating obligation can be. We found out again on Tuesday that voting in Illinois is like depression. You know that you don’t matter. You wonder why you don’t just give up. The vote doesn’t make a difference and our choices show that our parties don’t care about us anyway. This isn’t a conservative rant. The vote seems as useless to Illinois Democrats as Republicans, though the reason why is different. Democrats stick with their values and pretend their candidates support everything the party claims to believe in even while all the evidence screams otherwise. Republicans don’t even know what values they have. The goal is to put a candidate in office. We can worry about the why later. Democrats who blasted the 1% in the wake of the recession decided to endorse J.B. Pritzker, a candidate who epitomizes the wealthy elite. Not only is Pritzker a billionaire, he’s a white male billionaire, one of the most despised symbols known to liberal America. It makes no difference. The few who showed up at the polls on Tuesday not only decided he is the one to represent their diverse, inclusive, pro-woman, pro-immigrant views, they made that pick by a wide margin. Why? Pritzker is a rich white guy. He’s very electable and the party knows it. If you actually endorse the values Democrats made their stock and trade after Trump took office then Pritzker’s candidacy is just more proof that you don’t matter and that voting in Illinois is a hypocritical waste of time. If he really represented the poor and downtrodden and embodied his party’s values, wouldn’t he have been able to sell himself and his good deeds without spending more money than most working families can even conceive of? Perhaps all that campaign spending could have gone to paying the medical bills of the people being offered the promise of a state public option in exchange for their support. That’s one way to promote liberal values, but it’s not how the system works. Politics is about big money, not big hearts. Without a pile of cash a big heart doesn’t matter a damn. Republican voters didn’t fare any better. Much of what Jeanne Ives said about Rauner was right on the money, though the governor has a lot more of that than his opponent could lay claim to in her failed bid for the nomination. Our governor has a lot to answer to conservatives for, so on Election Day we put him back in the race for another term. If you missed it on Tuesday night you can still watch the governor’s victory speech. While I listened I knew that something was off. Then it hit me. There weren’t any white guys on the screen. When the camera drew back and I saw who was out of the picture I felt like I’d been had. The whole thing was staged to make sure we knew Rauner was all about diversity. The governor isn’t stupid. Like Pritzker, he has to show that being a rich white guy isn’t a liability even though everyone expects Republicans to elect rich white men and women who spend their time on golf courses and lounging in country clubs. The truth is that winning candidates on both sides can spend their time on golf courses and lounging in country clubs because they have lots of money. Democrats just do a better job of making it seem like they don’t. So you’re unhappy and disillusioned. Your voice is never heard. You feel like you don’t matter and you’re right. The good news is that this isn’t your fault. The bad news is that in this state there isn’t much you or your vote can do about it. You don’t matter because the policies that cause us grief aren’t made to benefit you or even the people they are created for. They are the product of a battle over principles that serve political, not public goals. If this wasn’t the case our state wouldn’t be in the condition it’s in. The ones best served by what goes on here have set up shop in Chicago and Springfield. The ones least served just got hit with another income tax increase to pay for it all. What can you do to drag yourself out of Illinois’ pit of political despair? You can give up on voting. No more trips to the polls, especially for primary elections no one seems to care about. Or you can resign yourself to the fact that so many people have stopped voting that your vote counts more than it ever has. If only one third of voters take the time to go to the polls that means your vote speaks for those who are sitting at home on the couch eating chips and watching decades-old sitcoms. You make their decisions for them. The closeness of the Rauner-Ives race shows that voting matters. So does the election of Barack Obama and Donald Trump, candidates with wildly different political goals who were obviously elected by completely different voting blocs. This is Illinois, not Washington. Madigan has a stranglehold on how this state is run so the governor makes no difference, or so we’re told. Rauner sold out conservatives with a record that includes a big tax hike and a sanctuary state bill, or at least that’s what Jeanne Ives would have us believe. Pritzker is a very rich white guy looking for something to do. You cast your ballot for one or the other. No matter what happens you know that you don’t matter. Your vote is a loathsome fraud, though if you are a Republican you know that the biggest joke is on Democrats tricked into voting for a member of the 1%. The value lies in a moment of clarity. Illinois is on the way down but we haven’t hit bottom yet. When we finally do, whether it comes from the first state bankruptcy filing or a state composed entirely of politicians looking for people to tax, you will one day get to decide who will drag us out of the mess that Tuesday’s slate of candidates appears determined to maintain. On that day your vote will count more than ever because you will be the only voter left in Illinois. We also wouldn’t have a faux conservative Republican governor who continues to claim that “Illinois is worth fighting for” on his campaign website while the issues and values that put him in office are shunted aside because he is not the person who controls what happens in this state. On one level we can sympathize with Rauner. The job was a fool’s errand from the start. On the other, he can’t ethically ask for money to fight for Illinois with his signature at the bottom of our sanctuary state bill, but a donation popup slaps you in the face as soon as you visit his campaign site. For now let’s assume this is the dirty work of his campaign managers. Perhaps the governor doesn’t know anything about it.